Fidgeting and glancing down at Google Maps on your phone while driving is a timeless tradition. But there’s never really an excuse for driving around with your phone in hand, especially when magnetic phone mounts are cheap, safe, and convenient. If you’re hesitant to consider a phone mount at all, we can’t entirely blame you. They have a reputation for working poorly and falling apart quickly. But in the last few years, quality has improved considerably across the board. Now that phone mounts are physically reliable, inconvenience is their biggest issue. 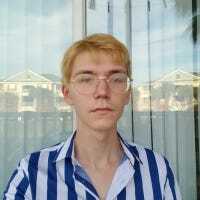 Tightening and loosening a cradle around your phone every time you drive is a pain in the neck, and it may not seem worth the trouble if all you’re going to do is skip a few tracks on Spotify. That’s why magnetic mounts are a monster of a convenience. Although a magnet may sound like an unreliable way to perch your phone, all of these mounts are built with high-strength neodymium magnets. Those are the kind that are used in microphones, fish tanks, motors, generators, and hard drives. Really, if you’ve been thinking about buying one of these for awhile, then you should just take the plunge. These are the best magnetic phone mounts for your car. They’re all around $10, they’re stupid convenient, and they make driving with your phone’s GPS safer. Ah, the classic air vent clip. These aren’t as crappy as they were a few years ago. 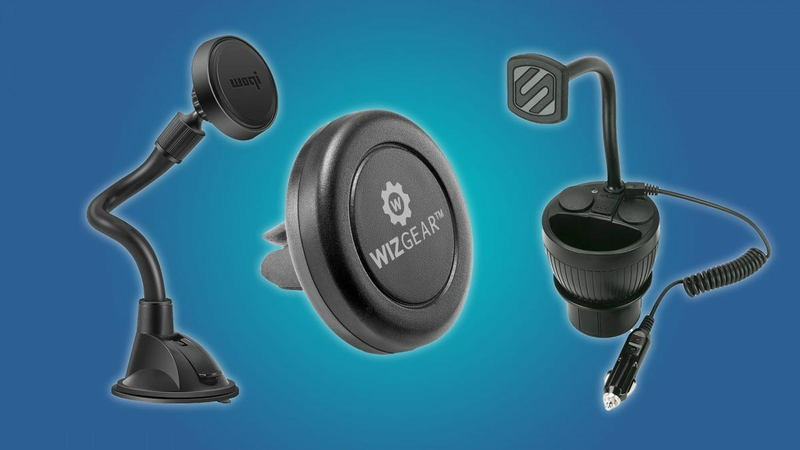 And WizGear looks particularly great. It isn’t bulky, it doesn’t weigh much, and its magnet is strong enough to hold most devices. 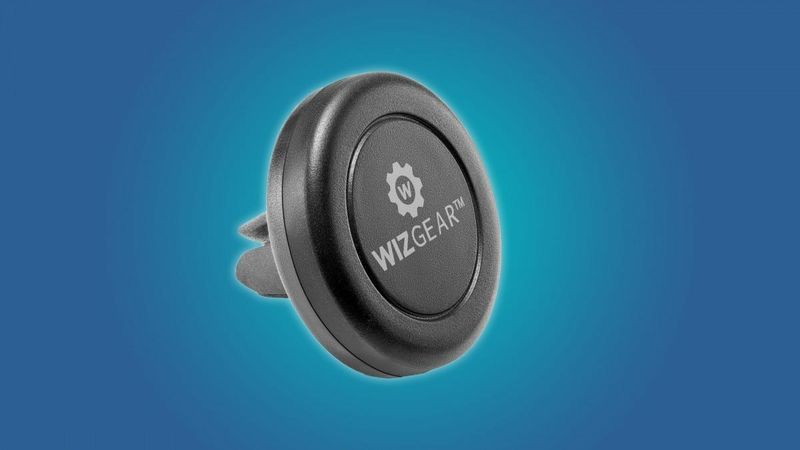 Oddly enough, the WizGear can swivel, so you can turn your phone from portrait to landscape mode without any hassle. This is a straightforward and convenient mount to use and install, and your phone will stay nice and cool over an air vent. Just don’t forget that air vents tend to differ from car to car. My car happens to have wimpy vents that slump when you put any weight on them. The WizGear’s pyramid-shaped tail should jam most air conditioner vents in place, but it won’t work for everybody. Yes, the SCOSHE stays inside of your CD player. And it doesn’t rely on adhesives or suction cups, the SCOSHE physically locks three rudders inside of the CD player when you twist a knob. This is a great option for people who want a phone or tablet screen on their radio. You can rotate your smart devices when they’re attached to this CD mount, so turning your iPhone or iPad into a dedicated GPS or music device is a cinch. Now, there’s a chance that this kind of mount can damage your CD player. Some people have no problem using their CD player while the SCOSHE installed, but I’m willing to bet that they’re listening to the same CD over and over again because it’s got to be a pain to unscrew this thing every time you want to put in a new disc. Personally, I stream all of my music and I’ve already ruined the resell value of my car, so I’m willing to take the risk with a CD mount. 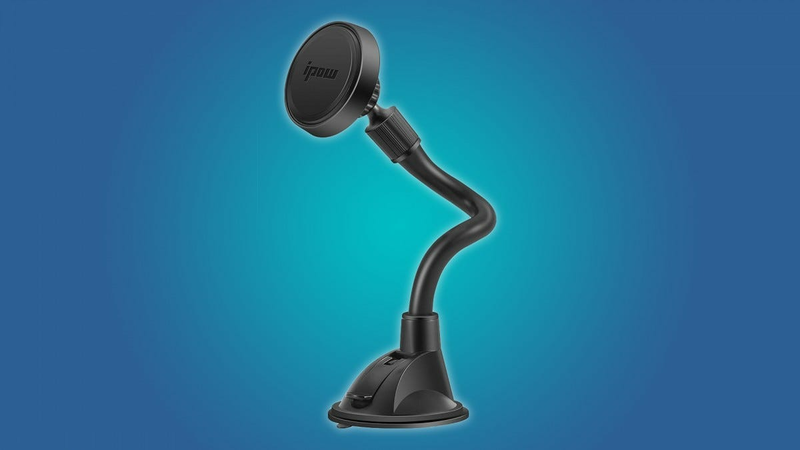 The IPOW adjustable window mount is a great option for people who share a car with others. It has a shock-absorbent and bendable gooseneck, so anybody can adjust it to their preference. And because the IPOW comes with three magnets for sticking onto phones, there’s no reason why you shouldn’t give one to everybody else who’s driving your car around. 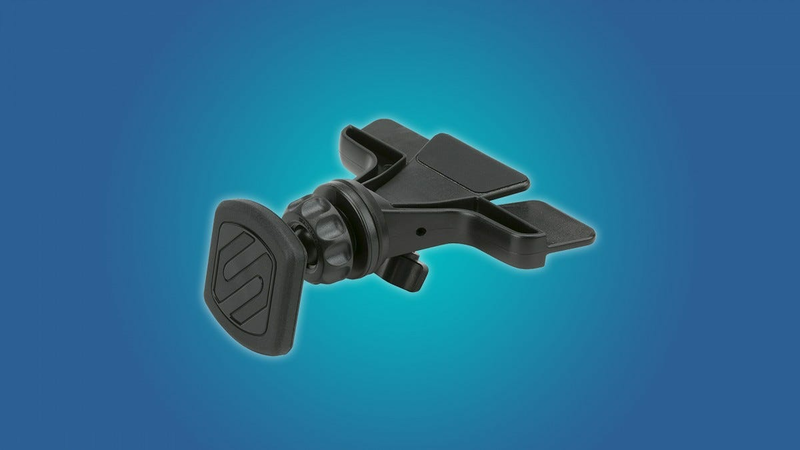 Of course, any type of suction-cup or adhesive mount comes with a bit of risk. If you live somewhere hot and humid, there’s a chance that your mount will come tumbling down and launch your phone under the passenger seat. But even in weird weather, a good suction cup is a good suction cup. Most of the time the point of failure isn’t the weather but dirty glass—clean the glass really good beforehand and it should stay put. Now, you don’t have to charge your phone when using the IPOW, but you should consider how difficult it will be to charge a phone that’s in one of these before you install it. If you stick this on the far left side of the dashboard, you may have to run a cable across your lap to charge a phone that’s mounted on it. It’s also tough to use a sun screen when this monstrosity is hanging from your window, but you like a burning hot car, don’t you? If you’re looking for something simple and convenient, the SCOSCHE is low-profile and can stick to some parts of your car. It won’t fit to heavily textured surfaces or faux-leather, so this kind of mount might work best on the smooth plastic that usually surrounds the radio. Of course, you could always stick this to the window, but it may not be convenient to reach for your phone. Now, if you have an unusually heavy phone or a tablet, you might want to look at something a little stronger than the SCOSCHE. I mean, the magnet works great, it’s the adhesive that may cause a problem. If you’re careening through some hot dirt road in your Mini Cooper with an iPad mounted to the SCOSCHE, the mount’s adhesive will probably give out and shoot the iPad into the hellish depths of your car. 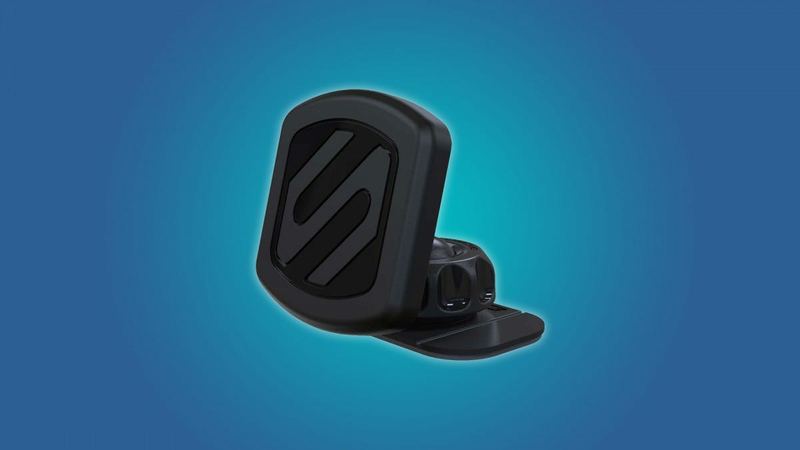 SCOSCHE advertises this mount for both the car and the home. If you buy a magnetic mount for your car, I would suggest grabbing a couple of these for your kitchen or office. You’re going to have a magnet stuck behind your phone case anyway, might as well take advantage of it. This strong and shiny arm suctions to your dash and hangs in front of your radio. 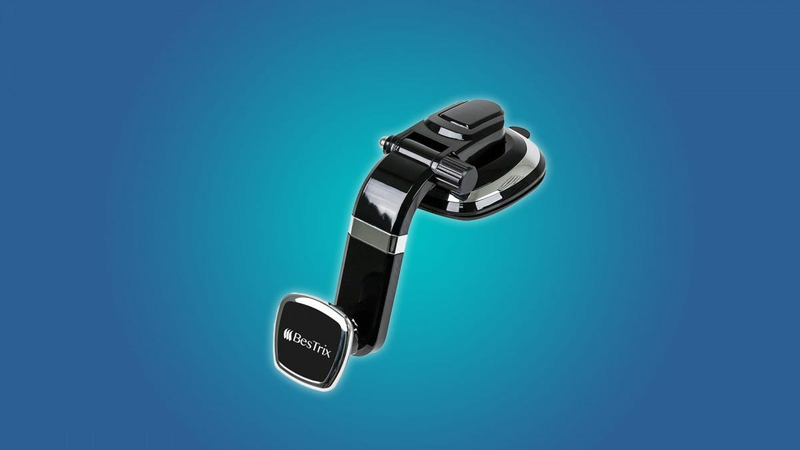 The BesTrix has a professional look to it and has enough strength to turn your iPad into a dedicated GPS and music player. There’s not much to say about the BesTrix, it looks good and works well. The device doesn’t have a lot of flexibility, but that’s fine. It’s not difficult to tell whether or not this is meant for you. Again, suction cups have a mixed reputation. Assuming that your dashboard is textured, you really need to make sure and clean it thoroughly before sticking anything a BesTrix to it. A clean surface always makes suction cups more reliable. By the way, if you’re afraid that the convenience of a magnetic mount may put your phone at risk for physical violence, you may be interested in a more traditional car mount. But I’d still suggest trying one of these magnetic mounts. No, I’m not kidding. Haven’t you ever propped your phone in a dirty coffee much just to see the GPS? The SCOSCHE Cup Holder Mount is stupid, beautiful, and ingeniously well thought-out. It solves every problem that the other mounts present. Have suction-cups and adhesives betrayed you throughout your life? Well, this cup holder mount works alongside gravity, rather than trying to fight it. Are you afraid that your phone will fall from a car mount like a dead bird and end up with a cracked screen? Your phone doesn’t have a long fall from this mount (although it may land in a cup of coffee). Do loose cables drive you bonkers? 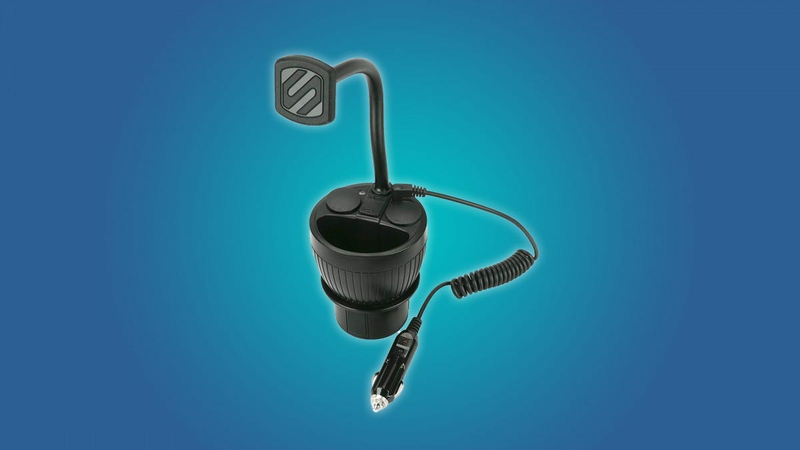 The SCOSCHE cup holder mount has two USB and two 12V inputs, so you can charge your phone while it’s mounted without creating a mess. You also don’t have to worry about this mount jostling around in your car, or not fitting in your car’s obnoxiously large cup holders. The SCOSCHE has expandable rudders that lock it into a cup holder for the rest of eternity. Perhaps you’ve noticed the hole at the top of the SCOSCHE? That, my friend, is for all of your weird garbage and crumbs. Don’t worry, this cup holder mount won’t stop that one friend from leaving weird trash and unfinished food in your car. But there are consequences to such decadence. Obviously, you have to volunteer a precious cup holder to hold a phone. Staring down at your cup holder while driving isn’t a championed safety technique (self-indulgence often carries the scent of danger), and the SCOSCHE may increase your cool factor a bit too much come date-night. Otherwise, nothing can threaten the mighty cup holder mount! The cup holder mount is a refined example of primitive beauty. 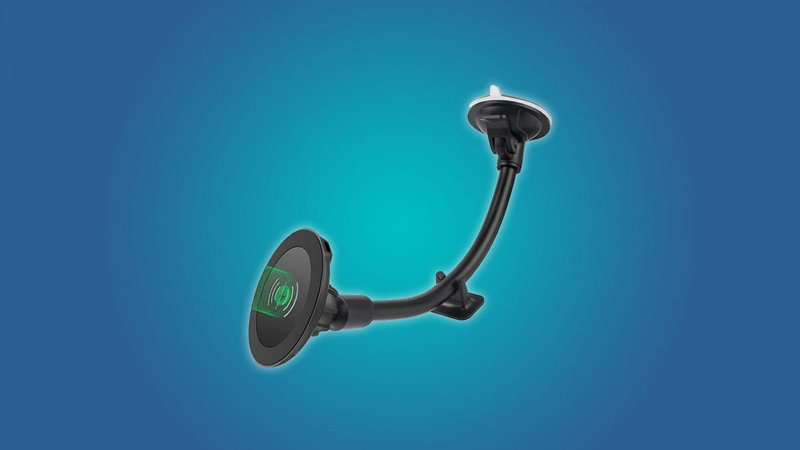 But the 2Bconnect window mount has an integrated wireless charger, and it offers us a wondrous peek into the future. If you’re looking at magnetic car mounts for their convenience, you might as well go all the way and get one that charges your phone. This is basically a futuristic, less flexible version of the IPOW. It suctions to your window, and it comes with a clip that adheres to your dashboard. Presumably, this should offer some shock diffusion and physical support. It’s also nice to have a mount that has to come unstuck from two surfaces before it violently wrings your phone through the interior of your car. The 2BConnect is convenient and cool, but it isn’t the final solution for managing the cables in your car. The mount itself needs to be plugged in if you want your phone to charge. But you’ll rarely need to unplug the 2BConnect, so if you’re concerned about a cable dangling in your car then you may ask well dedicate a USB cable to the device and find some sort of sleeves or tape to keep it low-profile.